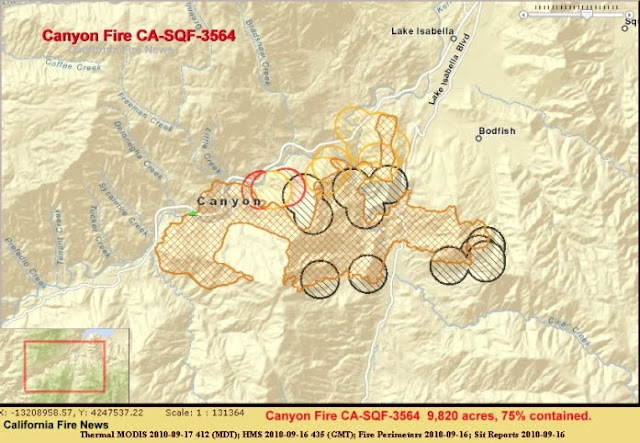 CFN - CALIFORNIA FIRE NEWS - CAL FIRE NEWS : Canyon Fire CA-SQF-3564 9,820 acres, 75% contained. #CaFire #Wildfire #CanyonFire CA-SQF-3564 9,820 acres, 75% contained. IA: 2:00 p.m. on Sunday, September 12, 2010. Location: Lower Kern River Canyon, below, (and west) of Lake Isabella. The fire started near Delonegha on the south side of the Lower Kern River. The fire quickly spread to both sides of the Kern River, jumping over the Old Kern Canyon Road and back across Highway 178, resulting in active fire on both sides of the two roads. Within an hour the fire spread to over 200 acres calling for evacuations of recreational sites along the Lower Kern River, including Remington Hot Springs, Black Gulch, Mill Creek, Hobo, Sandy Flat and Miracle Day Use area. Several outfitter guide (boating) companies camp sites were also evacuated. Road Closures: Highway 178 is now OPEN -Please observe all speed limits through the burned area off of Hwy 178 due to fire fighters and equipment on the road. The fire is presently at 8,560 acres. Evacuations: Evacuations have been lifted for Bodfish Canyon Road, Myers Canyon Road, Clear Creek subdivision and Rocky Point in the community of Bodfish. Be advised, the American Red Cross shelter is still operating at the Kern River Valley Senior Center (6405 Lake Isabella Blvd.). The phone number is 661-333-0265. Kern County Human Services staff is onsite working with Red Cross volunteers. A second shelter has been established in Twin Oakes at 661-867-2550. Both shelters are available to help accommodate small and large animals. Road Closure Update: Caliente Bodfish Road is open from Bodfish to Havilah. Travel is restricted to one lane to residence only. Old Kern Canyon Road is closed. Fuels Involved Grass, brush and timber. Fire Behavior Interior activity in Div.B from burning operation,some line activity on Division C, otherwise very little activity over rest of fire. Significant Events Crews are making good progress on line completion. Road closures are still in effect on Old Kern Canyon Road. Outlook/Planned Actions Continued air support of line construction; continue line improvement; continue mop-up operations. Remarks Steep ground and wind are still major concerns. Air resources continue to play a key role. Local power company continues powerline repair.